Plug and play wireless Bluetooth USB adapter creates cable-free connections between your PCs laptops and other Bluetooth devices such as Bluetooth enabled headsets, speakers, cell phones, keyboard or mouse at speeds of up to 3 Mbps. 12 month Worry Free Warranty and Customer Service will leave you with peace of mind. For any question, please feel free to contact us and we will responds to your issue within 24 hours. 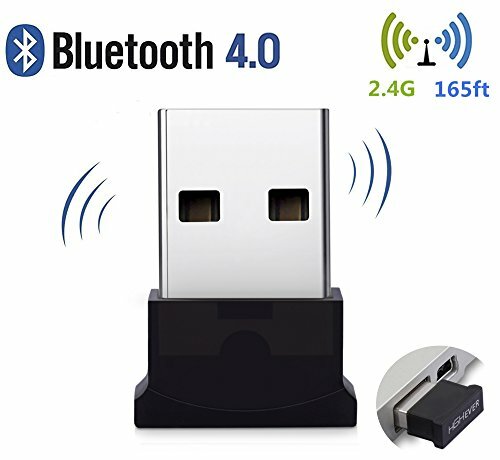 ※If you want to select an Bluetooth USB adapter with Advanced Bluetooth technology, the HIGHEVER Bluetooth adapter is exactly what you want! The Bluetooth adapter converts Windows computers into Bluetooth 4.0 compatible devices in a wireless environment with class 2 effective high transfer data rate and low latency energy consumption technology with gold plated connector. ※If you want to select a Bluetooth USB adapter with long distance and fast transmission function, the HIGHEVER Bluetooth dongle can meet these characteristics! Bluetooth USB adapter creates cable-free connections between your PCs and other Bluetooth devices such as tablets, cell phones, headsets, speakers, smartphone, keyboard or mouse at speed of up to 3 Mbps from up to 165 feet away. WIDE COMPATIBILITY: The Bluetooth USB dongle is compatible with Win 10, 8.1, 8, 7, Vista, XP, 32 bit or 64 bit. The USB Bluetooth adapter support plug and play to most Win 8 + devices without installing any external driver. The Bluetooth USB receiver also supports Bluetooth speakers, headphones, headsets, keyboards, mouse, and more. SUPPORT MULTIPLE DEVICES AT ONCE: The USB dongle adapter supports more than two devices connected simultaneously, A Bluetooth mouse, Bluetooth headsets, and Bluetooth keyboard can all communicate clearly with the USB wireless adapter and potentially open up a whole new realm of possibilities for how customers enjoy their computers. 65-165 FEET BLUETOOTH SIGNAL: The Bluetooth USB adapter adopts Bluetooth 4.0 version to provide you with fastest data and audio transmission. The wireless transmission range can be up to 165 feet in open space. The Wireless USB Bluetooth dongle adapter supports transmit data and audio files. If your desktop or laptop does not have Bluetooth function, the USB Bluetooth dongle 4.0 can endow your PC with Bluetooth function, you can easily connect a Bluetooth-enabled device. SECURITY & LOWER POWER CONSUMPTION: Bluetooth USB adapter with integrated FCC and CE security settings automatically in place, there's no need to worry about potential hackers or unwanted intruders getting into customers' business. Just as important, using USB wireless dongle takes very little power which is 1.2 to 3.6 VI/O. This makes the Bluetooth USB adapter an ideal tool to use for electronic devices. SATISFACTION GUARANTEE: Extremely compact USB Bluetooth adapter. Safe to leave in for laptop travel. Energy efficient, 12 month Worry Free Warranty and Customer Service will leave you with peace of mind. For any question, please feel free to contact us and we will responds to your issue within 24 hours.